This is the speech given today by John McDonnell, shadow Chancellor, at the TAS Partnership in Preston, an employee owned transport company, about building an entrepreneurial state at a local level. Thank you for the opportunity to say a few words here. I’m very pleased to be in Preston as I think the council here has provided a model of how an innovative local Labour administration can start to think and act creatively to secure sustainable economic growth. This kind of radicalism is exactly what we need across the whole country. Life for our local councils has been made incredibly tough. In a typically cowardly act, George Osborne has made sure the axe has fallen hardest on local authorities. He’s been outsourcing his austerity. For six years, councils have been scrimping and saving and doing the best they can whilst facing unprecedented cuts. And the cuts are grossly unfair. Councils in the richest ten per cent of the country have seen their funding cut by £28 per person since 2010. But the poorest ten percent of councils have seen their funding fall by more than ten times that, £228 per person. It’s been Labour councils, dealing with multiple social issues in areas of deprivation that have borne the brunt. I’m not of the opinion that we should just grumble about this, or wait for something to turn up. I believe in campaigning today. I’m in favour of taking action now to defend jobs, services, and local communities. That’s why the kind of innovations Preston is putting in place are so important. We know that we are lumbered with a Tory government that is bitterly opposed to genuine creativity. They’re visibly running out of steam. This is a government with no new ideas. As the recent IMF growth downgrade shows, Osborne’s recovery is built on sand. The Tories are just as vicious as they always have been. But they’re going through the motions. Look at the last month. A vindictive Budget by George Osborne that, incredibly, fell apart by the time it was debated in Parliament. It was Labour pressure that forced the reversal of the cruel and needless disability cuts. Barely a week later, and Tata Steel announced it was liable to shut up shop at Port Talbot. Forty thousand jobs are at risk, threatening entire communities. We stand to lose altogether a vital strategic industry. But with a Business Secretary committed to Thatcherism, government action has been woefully lacking. We can do so much better than this. I want to briefly lay out how I think Labour can help build a better, fairer economy. Labour’s emerging economic policy rests on three pillars. First, we think it’s essential that the government manage the nation’s finances in a responsible manner. That doesn’t mean setting unachievable and counterproductive targets like George Osborne’s “surplus rule”, which guarantees further austerity and clamps down on government investment. He’s failed on two of his other rules already. The Fiscal Credibility Rule means setting a realistic framework that will bring government borrowing on day to day spending under firm control, and allowing government the capacity to invest. With stormclouds brewing across the globe, a growing consensus from the IMF to the TUC is calling for governments to invest in the future. George Osborne has made plenty of noise about his investment programme. But to meet his failed fiscal surplus target, he’s actually going to cut government investment over the next few years. The next Labour government will look to deliver real investment, across the whole country, in vital infrastructure and science and technology. That’s what Labour’s Fiscal Credibility Rule provides. Second, we think it is quite wrong to presume that the state has no role in shaping how industries and new technology will develop. The hands-off approach is what Sajid Javid believes in. It is leading to the collapse of our steel industry, even whilst other governments intervene, like they are in Germany and the US. Compare British steel under the Tories with British car manufacturing, which was supported in the dark days after the financial crisis by a Labour government committed to intervene. Britain today exports more cars than ever in its history. It’s a huge success story, and it would not have happened without decisive government intervention. This means a complete break with the failed ideology of standing idly by and pretending only markets can decide. This isn’t just something for national government. What Preston is showing us, like other local councils, is that we can create entrepreneurial local states, too. That leads onto the third pillar. There is a fundamental shift at work in the global economy. It presents a profound challenge to what many of us on the left thought as the fundamentals of how the world operates. It has been a long time coming. Over the last three decades, the balance of power in our economy has shifted steadily away from those who work and towards those who own wealth. The share of national income going to workers has fallen steadily. Today, it is the lowest it has been since records began. Less than half of our national income goes to workers. Since the crash we’ve seen how the weakness of workers’ bargaining power has turned into low-paid, insecure work for millions. Real wages have slumped, and are not set to recover to their pre-crash levels until 2020. On top of this institutional weakness there are now new technologies that threaten to disrupt even established patterns of work. The Bank of England estimates that in the UK 15 million jobs are at risk of being destroyed by automation. Richard and Daniel Susskind have argued that these disappearing jobs will include many in what we historically think of as the professions. Automation will eat away at the traditional roles for lawyers, accountants, and doctors. But whilst new technologies like automation are threatening the structure of existing work, economists are warning that we may have to get used to a world of far lower growth. A Bank of England research paper, published this month, shows that long term rates of growth have been falling for some time. Lawrence Summers, former US Treasury Secretary, is amongst those warning of what he has called “secular stagnation” due to long term changes in the economy. This is the idea that presently low rates of growth may not be a temporary blip but continue for a long period of time. Now, I think there is a more optimistic option. I believe in using government action to secure investment in the future and deliver prosperity for all of us. But we have to be clear that this will not be enough. If we are drifting into a world in which private capitalism will not deliver the high rates of growth it used to, the consequences are profound. We know from the work of Thomas Piketty that when rates of growth are low, workers lose out. Inherited wealth does better and better. All those hoarding their riches in tax havens, or putting their millions into property speculation will get richer and richer. They will grab more and more of the pie – if growth does not return. That is Piketty’s fundamental argument. But a world of low growth means that the fundamental question faced by the labour movement changes. When growth is high, incomes can rise rapidly. The key issue is ensuring that those incomes are distributed fairly. This way of thinking has dominated the labour movement since the end of the Second World War. It was Tony Crosland’s central argument. Labour governments since 1945, whether Old or New Labour, have looked for ways to redistribute incomes. But if growth is low, incomes will rise more slowly. It is much harder for the government to redistribute incomes when they are not rising so rapidly. That means the priority for progressives must be not so much the distribution of income, as the distribution of ownership. We need to think of ways in which we do not just use the tax and benefits system to produce more equal outcomes in terms of income. This is the third pillar of our developing policy. We have to think of ways in which the wealth of society is better managed. Labour must be a party that is concerned about ownership of wealth and assets, not only the distribution of income. This is much closer to an old tradition in the labour movement of decentralised ownership and democratised wealth. It is the tradition of RH Tawney, GDH Cole and of course the co-operative movement. It was why I’ve spoken previously of the need to create a “Right to Own”. We want to empower local authorities, communities and workers to think and act creatively when it comes to building a fairer, more prosperous economy. I think workers in workplaces threatened with closure or takeover should have first refusal on buying out and running their place of work. With two-thirds of Britain’s family businesses at risk of closure when their owners retire, employee ownership can help solve our brewing succession crisis. I know the council here in Preston has already started working on this, providing help and support to those business owners retiring and making sure viable businesses stay locally owned. The opportunity here is huge. The UK’s co-operative sector is currently worth £37bn. This is far smaller than Germany or certainly the US. Our co-operative sector is just 20% of the size of Germany’s. But it’s grown by 15% since 2010 – faster than the rest of the economy. And fifteen million people now own a share in a co-operative. That’s up 16% since 2010. The evidence suggests that co-operatives are more resilient than conventional businesses. Twice as many co-operatives survive the crucial first five years as other businesses. And worker-owned companies have a clear productivity advantage over conventional businesses. So we should be more ambitious about what can be achieved here. We want to see resilient, high-productivity businesses in an economy that is fairer for everyone. The next Labour government will work with the co-operative movement to at least double the size of the co-operative economy. That’s a £40bn boost to the economy. We’ll support the good that co-operatives are currently doing. It’s not good enough that the Treasury has only two members of staff concerned with the co-operative sector. Lord Kerslake is leading a review for the Labour leadership of the Treasury and its functions, looking at how we can make this institution work for a fairer, more dynamic economy. It’s due to report later this year. But I would want to see a real increase in civil service resources for co-operatives and mutuals, putting them at the heart of policy making. We’d look to introduce legislation to assist the formation of mutual guarantee societies, mobilising funds for small businesses by enabling them to club together to raise credit. Over 8% of lending to SMEs across Europe is made through mutual guarantee societies. We can end the starvation of funding for our small businesses here. Community ownership of energy, which Jeremy Corbyn and our shadow energy secretary, Lisa Nandy have highlighted as a priority, has boomed in the last five years. Turnover has risen by 1,400%, as local communities realise the value of community ownership in both providing a revenue stream, and helping us move towards a low-carbon future. Yet this government has cut support for renewable energy suppliers, and removed incentives for communities to invest. In Government we must repair the damage done to the sector through the withdrawals of incentives to investment such as Seed Enterprise Investment Scheme for genuine community-owned energy schemes. Community solar schemes like Bannister House in London, which I visited last year, show how small-scale renewable generation can help in the drive to create fairer and more prosperous local economies. And with the rise of precarious employment and the so-called “gig economy”, co-operatives have a clear role to play. An excellent paper by Co-operatives UK, published this month, made the case very convincingly. By sharing the costs of necessary administration, co-operatives set up to support the self-employed and micro businesses can play a vital role. The risks of self-employment and precarious work can be reduced. I would like to build on the example set by the Musicians Union, organising music teachers into co-operatives rather than letting them sink or swim as individual freelancers. Unions, government, and the co-operative sector themselves can all play a part here. We are facing a choice as a society. We can either stick fearfully to the failures of the past and of this government in particular. Low pay. High debts. Rising inequality. Or we can see the opportunities ahead of us, and seize them with confidence. Co-operatives and new ways of owning and managing society’s wealth are an essential part of Labour’s vision for a better, fairer economy, as we’ve seen Preston starting to lead the way. 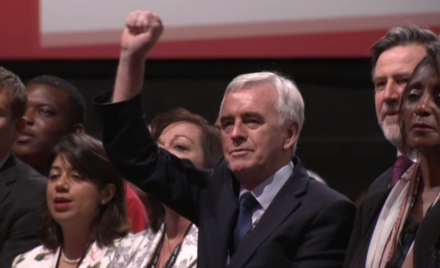 John McDonnell is Shadow Chancellor and MP for Hayes and Harlington.